#howtostaysaneinacrazyworld hanging from a Chandelier somewhere in the glittering canyons of manhattan. – teamgloria, inc.
#howtostaysaneinacrazyworld hanging from a Chandelier somewhere in the glittering canyons of manhattan. Posted on February 27, 2014 by teamgloria in people., places., things. 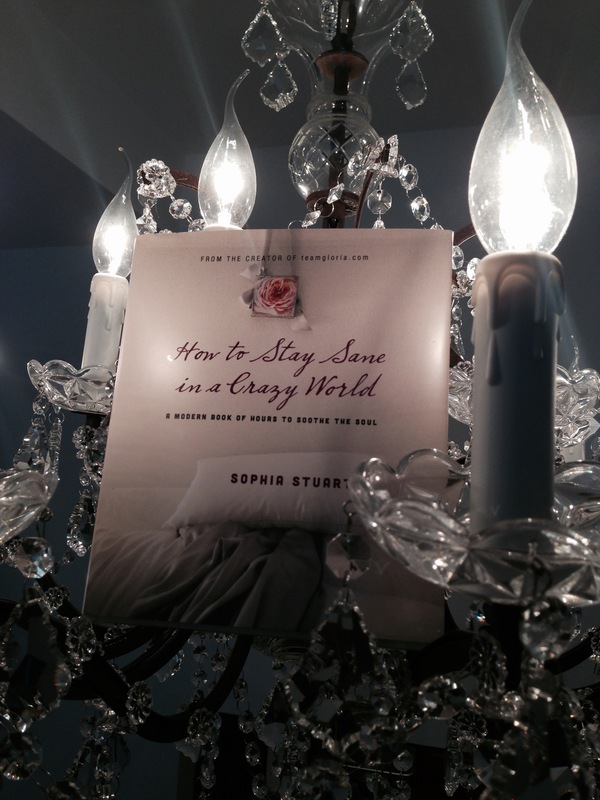 our lovely friend Donna sent us a Sighting of the book swinging from a Chandelier! and to make it Even more delicious – there’s a Video Too! we Do have really g l a m o r o u s friends. Next Post 1st sighting in Brighton, England – and Bella Basks By The Book on the Other Coast. Ha ha! The chandelier sighting is awesome! Where I live, there is a coffee shop that encourages people to take one of their branded paper cups on their world travels and then send a photo. This shop has a digital photo frame of people holding their cup in China, London, Mexico, Australia, etc. I’m hoping your book will start to show up in such far-flung places. The chandelier video is almost like throwing down the gauntlet in this respect, don’t you think? it IS a hard act to follow…..but we are sure the clever (smart, kind and lovely) Readers who Bought the Book will Rise to the challenge! My copy came in the mail too!! Excited beyond words, given other news from the day. What a day!! so excited to hear what you think and see a picture of the 1st Sighting In Seoul!! thank you again for buying one – we really appreciate it. The first post I read this morning and it is glorious. thank you dear – as you can imagine we *swooned* as soon as we saw the book hanging from the chandeliers like a Flapper at the Follies. And I am not quite swooning, but I am excited….Amazon has dispatched the Book. It’s travelling as I write. That is beyond glamorous and deeply into the Glorious realm. How wonderful. the 1st Sighting in FRANCE! thank you again for buying a copy, that means the world to us! Now that is very good! like a Flapper at the Follies. or (being British) – a cutie at the cafe royal.